A Silver Airways flight landed Thursday morning at the Abel Santamaria International Airport in central Santa Clara city opening a second US commercial connection with Cuba, following a Jet Blue first flight on Wednesday, in what has been the resumption of direct regular flights between the US and Cuba since they were cancelled over 50 years ago. Silver Airways CEO Sami Teittener was among the passangers to land at the airport, where they were welcomed by Commercial and Business vice-director of the Cuban Airport Service Company (CACSA) Rosa Elena Nieves and by airport director Omar Andres Gil. In statements to reporters Teittener said this is the first time ever for a Silver Airliner to have made a commercial flight to Cuba and now those planes will be coming to Santa Clara three times a week. 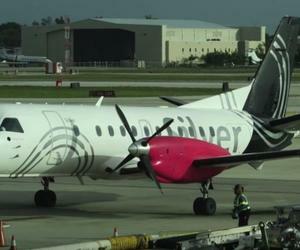 Silver Airways expects to also visit other Cuban destinations, including eastern Camaguey and Holguin cities and also Cienfuegos in the south-central territory. Such flights will start in October and in November Silver will fly to Cayo Coco key, off the central Cuban coast, and Santiago de Cuba, while in December the destinations will include western Matanzas, eastern Manzanillo City and Cayo Largo Key. For Silver CEO, Cuba is an emerging market with huge opportunities for development over the next few years, given its tourist potential and the presence in the U.S. of a large Cuban American community. Teitterner presented airport director Omar Andres Gil with a replica of a Silver airliner, while Gil gave him a nice craftwork.